March 25th, 2019, Charlottetown – Speed Skate PEI has revealed its team for the 2019 Canada East Short Track Championships, taking place in Campbellton, New Brunswick, this weekend. 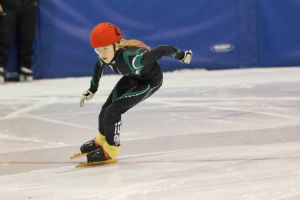 Five skaters will fly the Island flag, in a field of more than 120 of the best 11- to 15-year-old short track speed skaters from Ontario, Quebec, the Atlantic Provinces and Nunavut. Team P.E.I. will be led by Carter Bruce and William Lyons. Both skaters represented P.E.I. at the Canada Winter Games in Red Deer in February. Lyons, who has three Canada East medals to his name over the last two years, will challenge the best in the 14-year-old boys category this year. Bruce will be making his fourth Canada East appearance, competing in the 15-year-old boys category. The Stratford skater was a member of provincial record-setting relay teams at the past two Canada East events. Jane Bruce will be one of five Islanders competing at the Canada East Short Track Championships in Campbellton. Photo courtesy of Amanda Burke. Zack O’Meara and Alex Rogers, both from Charlottetown, will compete in the 12-year-old boys category, while Jane Bruce will race among 11-year-old girls. All three will be making their Canada East debut. O’Meara has won five medals in five outings on the maritime circuit this season, showing significant improvements from the previous year. Jane Bruce has notched a pair of gold medals, along with a pair of silver medals so far this season. Rogers is coming off a podium finish at the Atlantic Canadian Short Track Championships in Dieppe and has been among the top Atlantic skaters in his age class all season. Sarah Taylor will be making her fifth trip to Canada East as coach of the P.E.I. squad. Racing gets underway with the 1500 metre and 200 metre events on Saturday and will conclude with the 400 metre and 2000/3000 metre points races on Sunday. Island skaters will also participate in relay events as members of inter-provincial teams on Saturday and Sunday. For more information, visit www.speedskatepei.ca.